Established in 1923, Echo is an American design brand with a love of strong colour and vibrant patterns. 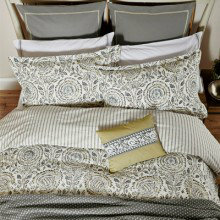 A beautiful bedding collection from Echo New York featuring a paisley and floral design inspired by traditional Indian printing blocks. This lovely collection includes a variety of different duvet sizes, pillowcases and cushion. 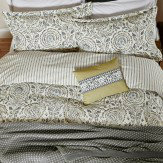 A gorgeous bedding collection from Echo New York featuring an Indonesian inspired pattern in a stunning indigo colour. This stunning collection includes a variety of different duvet sizes, pillowcases and throw.